For winning the league championship my father was given a gold watch. This came from the Frankford Athletic Association, not from the NFL. There was no cash bonus. Frankford was set up as a charitable organization, so all proceeds above costs were given away in the community. In 1926 they were able to donate a coal heater to the Frankford Day Nursery. When my Dad returned to Iowa after the season, he received a handwritten letter from the Frankford management. At the end of the year banquet they had forgotten to ask him to return for the 1927 season, and they were terribly sorry about this oversight. With player-coach Guy Chamberlin leaving to join the Chicago Cardinals, they were especially worried about Dads return. In the end, he did return, but only for the first part of the 1927 season. Then he followed Chamberlin to Chicago. and who wont be thrilled to see Hap Moran diving through that line again. Surely everyone recalls the shouts of last season, Put Hap Moran in, and how Hap did respond. Just like gasoline, those cheers seemed to put pep in his motor. He was getting many more opportunities to dropkick and placekick the ball. In the second game of the season he made the first score on a pass reception followed by a 40 yard touchdown run, then kicked the extra point. In the second half he kicked a 46-yard field goal. Two weeks later he was again a the mainstay of the offense. (He) continued to display his prowess as a placement kicker by booting the pigskin between the uprights from a distance of forty-two yards. Over the weekend it is believed he set a new record for long distance field goal kicking. Guy Chamberlin and the Chicago Cardinals continued to beckon - they wanted Dad for his kicking skills. By the end of October Dad had left the East Coast and was playing in the Windy City. 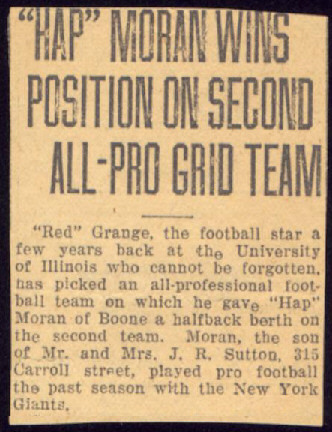 In his first game as a Cardinal he scored their only touchdown as they lost to Red Grange and the New York Yankees 7 to 6. Line plunging by Jones, Strader, and Lamb and two timely passes were the ingredients in the drive to the Yankees eight yard line. Moran went over for the score. 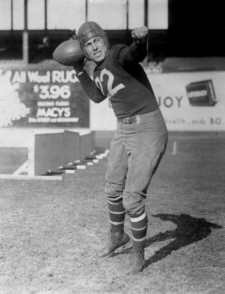 Although Moran is reputed to be a drop kicker, the Cards chose Big Bub Weller as candidate to tie the score. Weller came much closer than usual but didnt register. 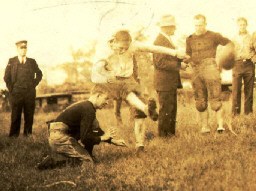 Dad ended the 1927 season with 27 points, 12th in the league overall and 2nd in Field Goals. In 1928 Dad moved to Pottsville. The 1928 roster would produce three Hall of Fame players - Pete Henry, Walt Kiesling, and Johnny Blood. Dad started as halfback and although the team didnt do that well, two important developments took place. The Maroons helped him develop his skills as a pass receiver and, in the game against the Giants, Steve Owen knocked himself unconscious trying to tackle my Dad. That began a life-long friendship and a move to New York to end the season with the Giants. He stayed with Mr. Maras team for six years. The next three years were great ones for Dad. In 1929 he was teamed up with Benny Friedman, Tony Plansky, Len Sedbrook, and Ray Flaherty. They provided the Giants with a tremendous scoring punch. 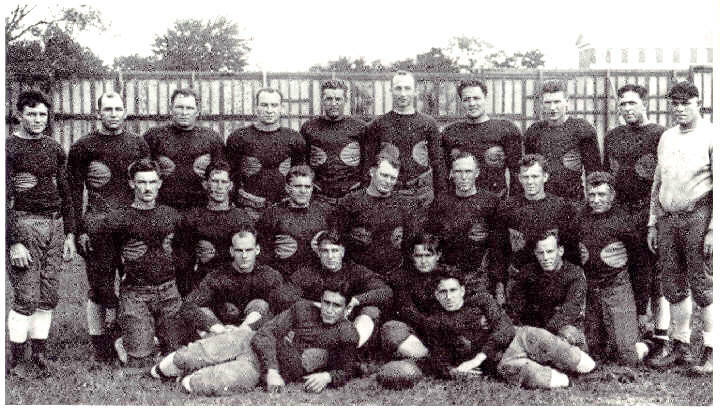 The Giants scored 312 points in the 1929 season and ended up second in the NFL with a record of 13-1-1. Dad caught four of Friedmans 20 touchdown passes, ending the season with 30 points. He had an especially great game against his former Frankford teammates when he ran back an interception for 50 yards and a TD, caught a Friedman pass in the end zone, and passed for a touchdown to Mickey Murtagh. A willowy young man named Hap Moran, who put Grinnell on the map before essaying East to try his football fortune with Frankford, was the cause of the Yellow Jackets defeat. Mr. Moran left the Yellow Jackets some two years ago, and is now a member of (the) Giants. And what a prize he turned out to be. For one period the Yellow Jackets stood up toe to toe with the well named Giants, doing fairly well until this fellow Moran appeared. The Grinnell alumnus never played as he did yesterday. Moran was here, there, and everywhere. He put a shot of new life into the Giants the moment he entered the game. From there on it was easy sailing. The New York sharpshooter, Benny Friedman, scaled four of the five touchdown tosses for the Giants, and Hap Moran accounted for the fifth after he had been on the receiving end of a pair of Friedman bullseye throws earlier in the game. In the first three minutes (of the third quarter) the Giants scored their second touchdown. Moran tore off 32 yards and followed with a run of 41. Feather then made 4 yards. Friedman threw a forward pass to Moran standing behind the Bears (goal) line. The Friedman-Moran combination scored another touchdown right after this. They worked the ball up to the Bears 28 yard line and then the former idol of Michigan took the ball in his right hand, ducked a Bear that came dashing at him and heaved the ball into Morans arms. The crowd gave Benny a big ovation and also Moran. Having accomplished a good day of football, Coach Andrews took Friedman out of the game. Then Moran took up the forward passing. This big boy can throw that leather oval. He shot one though the air standing on the Bears 48-yard line. Feather speared it this time on the 25 yard line. Near the goal line he was hit from behind. He fell to the ground while his tackler went off to one side. Feather rolled over several times and right over the goal line for the fifth touchdown. The week after their 34 - 0 romp over the Bears, the Giants lost to Green Bay 6 to 0. The Green Bay touchdown was set up by an interception of a Friedman pass deep in Giants territory. This loss cost the Giants the NFL title that year, as Green Bay finished 12 -0-1. That order of finish would be repeated in the 1930 season: Green Bay in first place, the Giants in second. Two games stand out in my Grandmothers scrapbook. She traveled from Iowa to Chicago to see her son play against the Chicago Cardinals, and he must have been inspired by her presence as he passed for one touchdown, rushed for one touchdown, and kicked an extra point in a 13 to 6 win over the Cards. 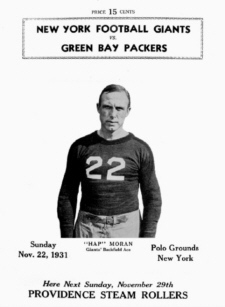 Hap Moran, half back from Carnegie Tech, assumed the hero role for the Giants. Friedman had tried 8 passes in the first half and completed one for a gain of 19 yards. Moran also tossed 8, but only one was incomplete and one intercepted. The six good ones totaled 147 yards. When the teams came back after the intermission, Hap Moran was in the Giants lineup. A few minutes later he shot a five-yard pass to Hagerty who set off on a dead run, changed his pace several times, reversed his field four times, and finally eluded the safety man to complete a 60 yard run for a touchdown. The Cards still were in the lead, however, as Morans place kick was blocked by Duke Slater. The deciding touchdown was put over less than two minutes later. With the ball on his own 30 yard line, Moran sailed a 35 yard pass into the arms of Campbell, New York end. Another pass to Campbell netted 7 yards. Moran then faked a toss, and swept down to the Cardinal 15. Wilson cut through right tackle for 8, picked up 5 at the other side of the line, and Moran crushed over for the winning score. His place kick gave the Giants their 13 to 7 margin. Officially Dad scored 27 points in 1930, but his best play of the year resulted not in a touchdown but in a record setting 91-yard run that ended on the one yard line. (That set the NFL record for the longest run from scrimmage, a record that stood for nine years - it remained the Giants record for 75 years, broken by Tiki Barber against Oakland on December 31, 2005.) 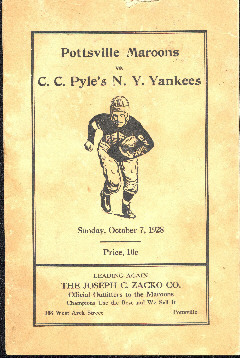 The opponent in 1930 was the Green Bay Packers, the place was the Polo Grounds, and the crowd was large because it was Chris Cagles first game as a pro after his All American play for Army. But Cagle didnt last long in that game. Ten minutes into the game, with a deep gash in his forehead, Cagle was taken out and Dad went in to finish the game. On fourth down Friedman took the ball on a direct snap from center and plunged over left tackle for a 13-0 lead. In the 1931 season the Giants dropped to fifth in the NFL standings. But it was not all bad news for the Giants and certainly not for Dad. Mel Hein came on the team at Center, and Dad was scoring leader for the Giants and named to the second All Pro team. Dads game was very balanced in 1931 and he was given opportunities to score in every category. He was 4th in the league in field goals and 3rd in points after touchdown. He scored rushing, passing, and receiving. He also did some of New Yorks punting. In a game against Green Bay he threw a 54-yard pass to Ray Flaherty and then kicked a 27 yard field goal. Although the Giants ended the season with a 25 to 6 victory over the Bears, their record was only 7-6-1, a disappointment after coming so close to the Championship the year before. The Giants had two big problems in 1932. Benny Friedman went over to Brooklyn as a player-coach and the team, like my Dad, was growing older. Tim Mara had a solution for one older player; he asked veteran Steve Owen to take over as head coach. Despite a difficult beginning, Owen remained in that position for 23 years. The Giants dropped the first three games of the season, all on the road. Their opening home game, against Brooklyn, seemed to turn the tide. The 20-12 victory included a 71- yard touchdown run by Dad. The turn-around was short lived. A tie and two losses made for a disastrous 1-5-1 start to Steve Owens coaching career. Owen turned to Jack McBride, scoring leader for the Giants in 25, 26, and 27. He led the Giants to victories first over Stapleton and then over undefeated League Champion Green Bay. The 6-0 win over the Packers was the major upset of the season, and Dad caught a 16-yard pass as part of the touchdown drive. McBride helped the Giants win games, but added to the aging problem. At the end of the 4-6-2 season, 16-year-old Wellington Mara handed his father a list of college players the Giants should go after to rejuvenate the team. 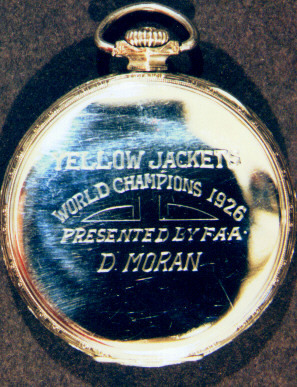 This was ridiculed in the New York press with lines like, Papa, please buy me a tackle. But on that list was the key to the success of the 1933 season -- Harry Newman, the All-America from Michigan. The Giants also acquired the services of Ken Strong in 1933. Strong had played for Stapleton since 1929, but his real interest was baseball. A botched wrist surgery dashed his baseball hopes, and Stapleton folded after the 1932 season, so the Giants signed him at a bargain $250 per game. It may well have been the best deal in their history. Dad had tough competition for playing time in 1933. In addition to Ken Strong there was rookie Kink Richards, Bo Molenda, Stu Clancy, and Dale Burnett in the backfield. Ends were Red Badgro, Glenn Campbell, and Ray Flaherty. Dad was alternating in the backfield with Strong in the beginning of the season, and played a major role in the Giants 56-0 win over the Eagles. In that game he set an NFL record for the most yards receiving in a single game - 114 yards on three catches. The record stood until 1937 when it was broken by Gaynell Tinsley of the Chicago Cardinals. Out of the downpour of touchdowns yesterday was unearthed a new forward pass combination which will hold its own with any extant. Harry Newman to Hap Moran is the combination that clicked practically every time and paved the way to the majority of touchdowns. The opening touchdown was fashioned by Newmans forty-five yard pass to Moran, who ran thirty yards more to score. It was a critical win for the Giants. They turned the corner from a .500 season to the divisional title. For my Dad his touchdown and extra point was his last score, and last headline, as a New York Giant. Ken Strong came to dominate and Dads injuries and age caught up with him. The Giants went on to play in the first NFL Championship game that year, a 23-21 loss to the Chicago Bears. Sitting on the bench Dad saw Red Grange tackle Red Badgro and break up the Giants last hope for a win in a game where the lead changed hands six times. Dad wasnt much for sitting on the bench. As his college coach had written, he does not seem to care what his appointed duty is, just so he gets to play. Besides, he was 32-years-old and it was the Depression. He needed to move on. He did play one more season with the Paterson Panthers in 1934, coached by former Giant Jack McBride, and then keep a hand in football by coaching. Hed done some coaching when the Giants sponsored a football team inside the walls of Sing Sing prison in 1931, and in 1936 he took the Paterson Panthers of the American Association to a 4-1-0 record. In 1937 he coached the Jersey City Giants. He married in 1937 and later moved to Sunnyside, Queens, a planned community with an extensive recreation program for youth. The day he moved in two boys knocked on his door and asked him to coach their football team, and he coached the Sunnyside Mustangs from 1938 until the outbreak of WW II. When Dad died in 1994, I received a letter from a woman who had been a cheerleader for the Mustangs. Now in her 70s, she noted how many of those Mustang players went into the service during the war, and how the lessons they learned on the football field served them well. Not everyone came home, but those who did had an annual reunion in Florida, and still remembered having the former Giant as their mentor. She wrote: He was an idol to the players. They were awed that they had the great Hap Moran as their coach. Im sure that, as much as any headline or record, would have brought a smile again to Haps face.